Two capital improvement projects are well along in the planning at Sharp Coronado Hospital: the “entry, arrival and parking” project and a new outpatient surgical center, the largest capital fundraising project in the hospital’s history. The new Payne Family Outpatient Pavilion is named after Bob and Patty Payne. Patty Payne grew up in Coronado, and after she and her husband recently moved back to Coronado, they met with Coronado Hospital Foundation staff and the hospital’s chief executive officer, Dr. Susan Stone, to inquire about how they could donate to the hospital in a way that would provide a significant benefit to the hospital’s long-term financial health and also serve the community. The Paynes have been joined in that effort, to date, by more than 20 local contributors, along with the City of Coronado, which is providing two-for-one matching funds. Through philanthropy, $10.5 million of the project’s $12.5 million cost has already been raised. The hospital conducted a feasibility study that demonstrated that a dedicated outpatient suite, including its own operating rooms, would bring in millions of dollars to the hospital’s operating budget. The study also noted that a dedicated outpatient unit would raise the profile of the hospital’s two Centers of Excellence — Joint Replacement Surgery and Hepatology (liver care). “We know our orthopedic teams provide the best in turn-around care and the best in clinical outcomes of any hospital in San Diego,” said Stone. “We wanted to create a pavilion that surrounds them with an environment that mirrors their excellence. “We can’t be the premiere program in San Diego and beyond without having a premier outpatient center,” she added. The outpatient center is the final leg in Sharp Coronado Hospital’s “Project 2020” master plan that was launched in 2003. Since that time, the hospital’s emergency department (the Lee and Phyllis Mather Emergency Department), the Sandermann Auditorium and Education Pavilion (in memory of Fritz Sandermann and in honor of Mary Sandermann), the ICU and all rooms, halls, gardens and elevators have been remodeled. In 2013, the hospital remodeled the former “Motion Center” and physical therapy unit into the Sewall Healthy Living Center. Last year the cafeteria was remodeled and expanded into the Mindful Café and Healing Garden. 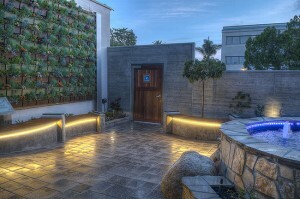 A key part of the project was the construction of a tall garden wall that recaptured lost space that had flowed into the adjacent parking lot. 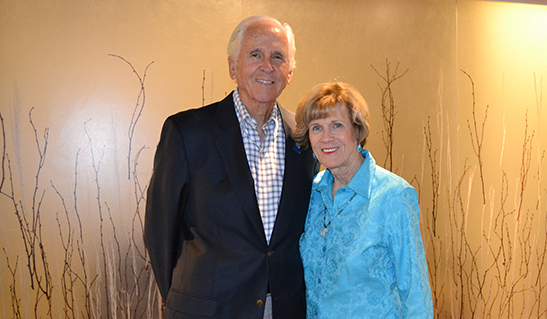 The hospital’s “entry, arrival and parking” project was the brainchild of Michael and Linda Dorn, Coronado residents who provided funding for the project. The project will redesign the parking configuration and main entrance to the hospital on Prospect Place and entry drop-off to the Payne Family Outpatient Pavilion and Sandermann Auditorium and Education Center on Soledad Place. However, as presently configured, the valet service at the hospital’s main entrance does not include a turnout and through traffic occasionally becomes blocked. The new plan creates a turnout for three to four spots for passenger drop-off and valet, allowing through traffic to be unobstructed. It also features an intuitive area for cars to make a u-turn identified by brick pavers to enter the valet/drop-off space. By restriping the parking at “The Villa” skilled nursing facility (also on the Sharp Coronado Hospital campus), the parking plan achieves a net gain of eight parking spaces. It also provides a short-term valet parking area for visitors making quick stops at the hospital. The main entrance to the hospital will be more clearly defined and enhanced with a portico, a “living garden” wall and sculptural treatments that tie in with the hospital’s seaside resort theme. Similarly, the entrance on the west side of the hospital, incorporating both the Payne Family Outpatient Pavilion and the Sandermann Auditorium and Education Center, will be remodeled. Four commercial parking spaces will be consolidated, allowing a turnout for passenger drop-off. At present, cars often double park along Soledad Road, and the new drop-off will provide a safer and less congested alternative. The parking project was approved unanimously by the Coronado City Council in February; groundbreaking should occur this summer with completion anticipated by the end of the year. Upon arrival at The Payne Family Outpatient Pavilion, patients will be greeted with a garden terrace exterior that features “the Coronado aesthetic,” said Stone, incorporating arbors seen at many local residences, citrus trees and roses. At the pavilion’s main entrance, Sharp Coronado’s signature nautilus shell will be embedded as a design motif in the porcelain tile path that resembles a boardwalk with accent tiles that resemble beach sand. 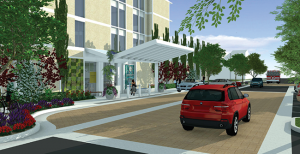 In keeping with Sharp Coronado’s patient-centered approach to health care, the pavilion will feature thoughtful touches such as concierge services, beautiful artwork, aromatherapy and massage. “Here people will be treated like guests, not patients,” Stone emphasized, noting that in the year 2000 the hospital was an early adopter of the Planetree patient-centered approach to health care. The pavilion will feature a separate lobby for imaging and women’s services that will have views of a healing garden. The suite will provide personalized mammography, DEXA scans, imaging and ultrasound services. A wound care suite will be located just opposite that suite. A separate lobby for surgical services will include a private garden. Rather than occupying one open room with “curtained” beds, Sharp Coronado’s outpatient pavilion will feature four private pre-operative rooms, each with a private bathroom. Both pre-op and four post-op rooms will feature calming garden views and abundant light through floor-to-ceiling windows, customized for patient privacy. The center’s two surgery suites will be equipped with advanced technology such as the MAKOplasty® robotic arm device for 100 percent precision during joint replacement procedures. One of the suites will feature live video streaming — allowing surgeons to broadcast procedures and allowing the center to serve as a teaching institution. The outpatient pavilion will also feature an endoscopy suite, where gastroenterology specialists can use diagnostic tools such as endoscopic ultrasound to detect diseases earlier and more precisely. The Payne Family Outpatient Pavilion will operate during regular business hours. Stone noted that an added benefit is that the post-operative rooms will be available as additional rooms to back up the hospital’s emergency department in the typically higher demand evening hours. Nora Boswell, chief development officer with the Coronado Hospital Foundation, said that a campaign is underway to raise the final $2 million for the Payne Family Outpatient Pavilion. In addition to funds that will be raised from the foundation’s “Black and White” gala on May 7 at Hotel del Coronado and golf tournament in September, Boswell said that there are still naming opportunities that begin at $10,000. Campaign gifts can be structured over three to five years, she said. To learn more, contact Boswell at (619) 522-3841. She added that a campaign wall listing the names of all donors who give $1,000 and more will be mounted in the reception area of the new pavilion. “And that wall will stay up as long as the pavilion is here,” Boswell said. The hospital’s main entrance on Prospect Place will be more clearly defined through installation of a portico and “living garden” accent wall, plus additional sculptural features and enhanced landscaping. A turnout will allow more convenient passenger drop-off and access to the hospital’s complimentary valet service. A garden terrace entrance to the Payne Family Outpatient Pavilion will feature arbors, citrus trees and roses. A “living wall” of plants is a focal point of the hospital’s Mindful Cafe and Healting Garden, which opened in 2014. A similar living wall sculpture will be installed at the hospital’s entrance.